Here’s a commission I’ve recently finished. It’s from some of my references when I was in Etosha National Park a couple of years ago. This particular waterhole, the famous Okaukuejo in Namibia, is permanent and that’s like gold in a dry park such as Etosha. Thus you don’t have to try hard at all to get great shots of animals in huge numbers coming to drink. In fact, they even built an ampitheatre of viewing seats around the hole and they light it up at night. It kind of annoys me, kind of gladdens me. Annoys in the fact that people like me who are prepared to work for their experiences see other people who can get the same viewing experince without raising a sweat at all. However, it gladdens me in the fact that these very people get to experience animals in such an environment and their lives must be richer for the experience, and they must surely become more educated in the need to look after these last remaining wildlife havens. However, it does it feel a bit unreal, sitting there with a few hundred people in comfort looking over a fence at life at its toughest for the animals, seeing a giraffe take two hours to walk one hundred metres, constantly checking for predators along the way, hearing lions roaring in the distance whilst sitting next to people drinking chilled wine with their attention on their latest gadgets. Still, not far from here it is dry and barren and as a result, you can get away from the throngs instantly because the heat keeps most people under the verandahs. 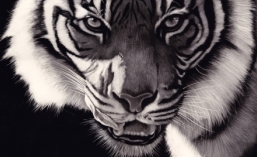 This is a scratchboard, 11″ x 14″ . I call it “Wall for Stripes” for obvious reasons. 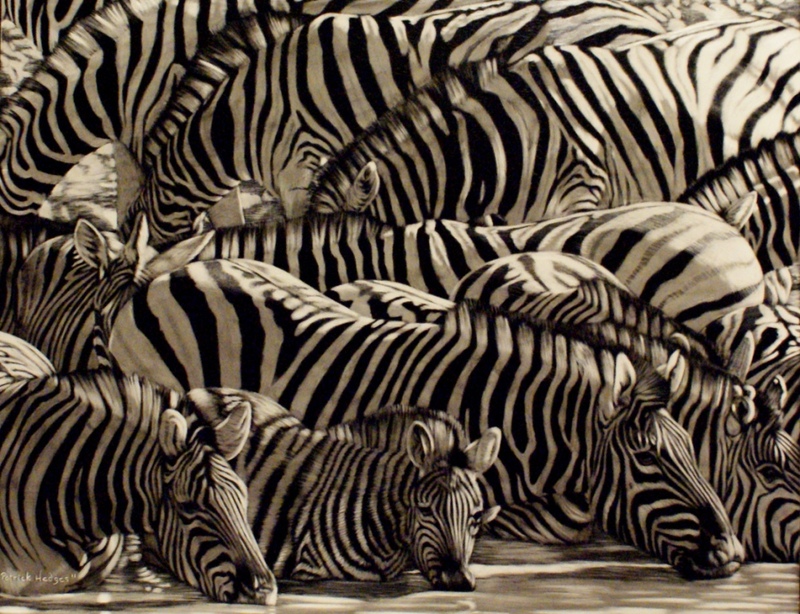 Zebras are great for the artist in that they present us with fabulous compositional opportunities and potential for drama. The main problem is keeping your eyes from going crossed as you work out where to put all the stripes! I’ve tried hard to show the hot African sun on the backs of the zebras, hopefully giving you the feeling of actually being there watching it all unfold. Its beautiful Patrick! Love it to bits! Hello Patrick, beautifully done!! The composition has an elliptical feel to it, very nice movement against the vertical stripes. Love it!